Water Fountain - 4 Foot Tall Sorrento Three Tier Garden Decor Fountain - Outdoor Water Feature | Fountain City Art Ctr. The European tradition of formal fountains lives on in this sophisticated, garden fountain whose cascading tiers lend soothing water music to any garden. Water cascades from an acanthus finial at the crown and gently flows from each line in dramatic waves of sound. Enjoy the soft shimmer and sensuous tone of the splashing spray as this fountain takes its place as a magnificent centerpiece of your garden. Hand-cast in quality designer resin and finished with pride exclusively for Design Toscano, the fountain is engineered for proper water flow with a built-in recirculating indoor/outdoor UL-listed pump that uses normal household current. Simple assembly required. 30"dia.x48½"H. 60 lbs. DRAMATIC CASCADES OF SOUND - The European tradition of formal outdoor fountains lives on in this sophisticated, garden fountain whose cascading tiers lend soothing water music to any garden decor. MAKE AN IMPACT! 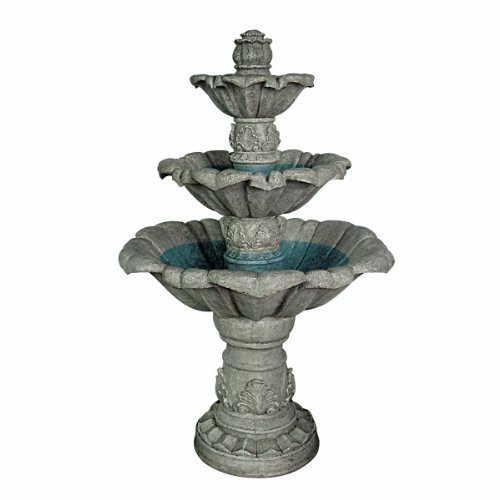 - Standing over four feet tall, this large fountain will be the focal point of your outdoor decor as garden decorations, patio outdoor fountain display or the center of attention on your front lawn. LOW MAINTENANCE OUTDOOR DECOR - Hand-cast using real crushed stone bonded with durable designer resin, our easy to set up water fountains require no additional plumbing and include adjustable UL approved, indoor outdoor fountain pumps. Just assemble, fill them with water to completely submerge the pump and plug it into a standard electrical outlet. Now enjoy the sounds of water music! DESIGN TOSCANO WATER FEATURE - Exclusive to the Design Toscano brand, this self contained, freestanding classic tiered garden fountain will be the focal point of your patio, lawn or outdoor garden decor. OUTDOOR WATER FOUNTAIN - Our perfectly sized water fountain for your lawn, patio or outdoor decor measures 30"dia.x48½"H. 60 lbs. This fountain includes a 160 GPH (gallon per hour) fountain pump. Three turtles (large) fountain Bronze Statue - Size: 34"L x 54"W x 68"H.